Well, I suppose every grad student has this moment: the moment when they realize that someone has already written their hoped-for dissertation. I would like to have a moment of silence in honor of a hope deferred……..
On the positive side, the work of Jessica J. Mudry looks truly fantastic, and I am so glad that someone has done the intense work of answering many of my questions in regard to nutritional rhetoric and public policy. To be honest–and less mellow-dramatic–Dr. Mudry has not actually written my intended dissertation, which would focus on the medical aspect of nutritional rhetoric. 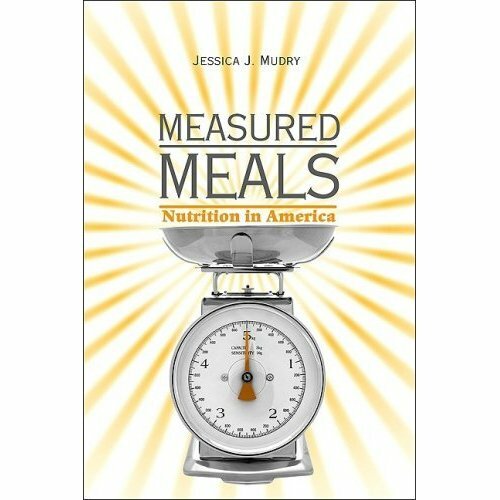 Her book Measured Meals: Nutrition in America actually focuses on the history of the FDA’s construction of nutritional guidance based on methods of quantification (conta qualification…?) of things like calories, kinds of foods, etc. I can tell you, this book is on my way to house as we speak…or, as I write, I should say. Searching for a biography of Dr. Mudry, I found several very interesting communities. The first is a group of scholars who hosted a conference entitled Domestic Foodscapes: Toward Mindful Eating? held March of 2008 in Montreal, cosponsored by Cornell and Concordia Universities, with panels on topics such as cooking practices, food technology and knowledge transmission, and the history of the kitchen. On her panel, titled “Representations of Food” Jessica Mudry presented a paper called “Mmmmm, high in omega-3s, just like mom used to make: Scientizing our foods and the changing experience of the family dinner.” (All abstracts from the conference are available on the Domestic Foodscapes web page). I found the second community while searching Social Science Full Text for articles by Dr. Mudry; she has published two in Food Culture and Society (one regarding the culture of alcohol and medicine). I will have to find and brows the journal; I’m not sure its particular focus or disciplinary affiliations as of yet. Jessica is currently an assistant professor of technical communication, and society and technology in the General Studies Unit at Concordia University, and her present research regards the history of calorimity and human nutrition laboratories in Germany and America. This makes me wonder how friendly she is (metaphorically, or literally) with Bruno Latour. This entry was posted in Medical Rhetoric and tagged Bruno Latour, dissertation, Jessica Mudry, Nutritional Rhetoric. Writing a book review of Nutritional Rhetoric might cheer you up–you get a CV line and reassure yourself that all has not been covered! That’s great advice. I should definitely get on it while it’s fresh. Thanks for the suggestion!